I assume, in jest, that at least a tiny part of the media blackout over the “anti-terrorist” wonton brutalities against civilians in southeastern Ukraine (Novorossya) may be the result of the decidedly unsexy quality of the fascist cohort participating in the Kiev junta’s campaign there. Foot soldiers of Svoboda and Right Sector paramilitary army (the Kiev junta’s so-called National Guard, formed as a volunteer army after the coup) look comically lumpen. 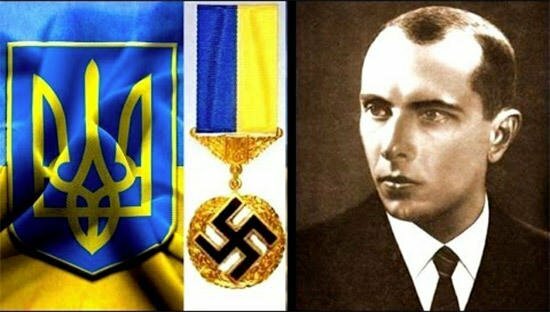 Moreover, they feel like a postmodern pastiche of the original Nazis—and so does their cult, a virtual fan club, of Stepan Bandera, the Galician butcher who notoriously collaborated with the Axis forces in the extermination of Jews, Ukrainians, Poles, and other undesirables in the East. Ideologically, they seem unreal, as though they had just crawled out of a deep bomb hole in history, which had not been quite repaired in the post war, absurdly calling out for “Glory to Ukraine.” A glimpse at fascist-parade photographs and videos of their subterranean, wormy faces set in the bully’s obstinate scowl, their heads shaven kapo style, hobnail-booted and pudgily stuffed in fascist-regulation black, makes one think of hastily rounded up layabouts as extras for an implausible B-movie about an improbable skin-head warfare in a high school anywhere in the USA. Despite their obvious fantasies, Aryan warriors headed for Valhalla they are not. 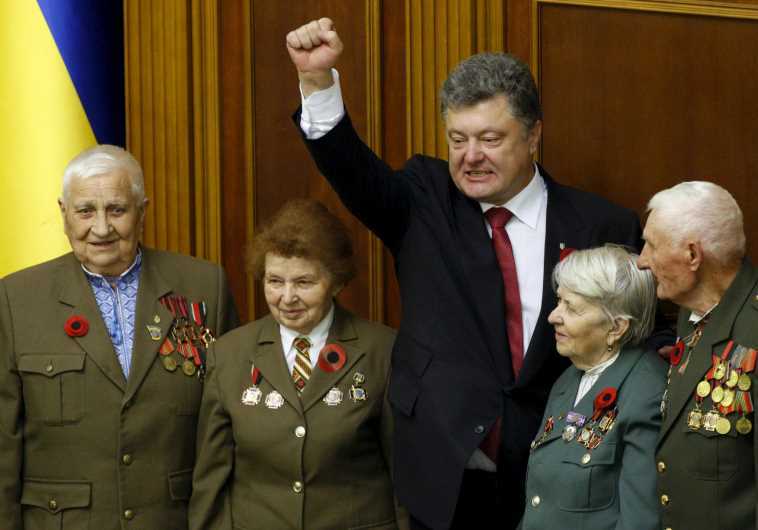 So, if they can’t be advertised as shining knights in America’s democracy armor or as specimen of a superior brand of military men, why were these retrogrades recruited to lead the Western-backed “pro-democracy” crusade in the Kiev Maidan and its aftermath? Not to establish their crude, personality-cult fascism in the “heart” of Europe, that’s for sure. NATO, together with the subservient EU financial bureaucracy in Brussels, already occupies Europe, up to the very border of Russia, if the Ukraine gamble succeeds. At present, nothing threatens this occupation arrangement; therefore, plotting to establish fascism in Europe would constitute unnecessary overkill. Rather, they were recruited as instruments in the destabilization, regime change, and eventual “anti-terror” operations to maintain in power the US-backed junta in Kiev, which is only a step in the larger objective: regime change in Russia. Svoboda and Right Sector garnered only 2% of the Ukrainian vote in the May elections. It doesn’t appear, therefore, that these two fascistic parties enjoy much popular support. Right Sector, ultra-nationalist, Ukraine-firsters, emerged out of the agitations in the Maidan. Svoboda is an anti-communist, Russophobic, and EU-friendly party, formed soon after 1990, which gathers together Catholic and Orthodox members and calls for the liberation of Ukraine from the shackles of the “Jewish-Muscovite mafia.” Among its many troglodyte posturings, the championing in 2010 of Ukraine-born, naturalized US citizen, and war criminal, John Demjanjuk, as a “hero of the struggle for truth” must take pride of place. After a lengthy and clamorous judicial process, Demjanjuk was deported from the US to Germany to serve sentence, having been found responsible for the death of 30,000 inmates at the Nazi death camp of Sobibor. Among lesser embarrassments, Svoboda had even founded a think-tank by the catchy title of “The Joseph Goebbels Political Research Center.” Last February, at the height of the “pro-democracy” Maidan follies, ardent “revolutionary-democracy” tourists traveled to Kiev to honor the leaders of this Western-manufactured toxic fascistoid fest—people such as Senator John McCain, the Archbishop of New York, Cardinal Dolan, celebrity “philosophers” Slavoy Zizek and Bernard Henri-Levy, international film stars, the ever-clueless George Clooney among them. Put in the context of US foreign policy for rolling back communism since 1945, the overthrow and substitution of the elected Yanukovich government, as planned, staged, backed, and maintained in the coup’s aftermath by the US, leaps straight out of that era’s covert political warfare playbook. “Political warfare,” which the Nazis perfected, combines propaganda, sabotage, and the training of “secret armies” for “counter-insurgency operations” (which translates in practice into population control by means of terror). That play had its premiere in 1953 in the CIA-orchestrated coup in Iran (after testing some of its destabilizing techniques in the 1948 electoral campaign in Italy, where communist victory was threatened and was, in fact, thwarted by these techniques). It enjoyed a run of seventy years on the world stage. Since 1989, it has been adapted, absent the supposed communist threat, to the effort of coercing the world into serving US economic interests. One project of the classic era of American anti-communist animosity, which luckily did not turn out as planned, is worth mentioning. In the late 1940s, a plan matured, so super secret that it doesn’t appear to have had a code name. Declassified in the 1980s, a 1949 statement by the Joint Chiefs of Staff to President Harry Truman reveals aspects of this plan, which integrated conventional and nuclear weapons with “counter-insurgency” operations. The US army, air force, CIA, and other intelligence agencies proposed a three-stage strategy to take out the Soviet Union, should open war become the desirable option: 1) mounting a campaign of propaganda, disinformation, and false-flag operations to provoke a confrontation with the Soviet Union, in which the US would appear to have to act in self-defense or in defense of X-group of Soviet-oppressed peoples; 2) conducting a military campaign lasting thirty days, during which seventy atomic bombs would be dropped on select targets in the Soviet Union from long-range planes to destroy 40% of Soviet industrial capacity, including its crucial petroleum sector; 3) launching post-nuclear, mop-op, “counter-insurgency” operations on the radioactive ground to prevent the Red Army from reassembling and the Soviet political system from reemerging. This last phase was to be entrusted to the “secret armies”—the Eastern European and Russian émigré groups, inherited from the Germans. In other words, Nazi-collaborator armies. The “bastards” of my title. (I have culled much of the information above from Christopher Simpson’s expose’ book,Blowback, about which more anon). A propaganda bonus to the US in this recruitment is the distraction, disorientation, and sheer terror, outside the mainstream media, that the presence of self-proclaimed admirers of Hitler provokes among the public both here and in Europe. While we focus on the supposed resurgence of Nazi-style militarism in Europe, we don’t look at its subtler practitioner in imperialist Washington. 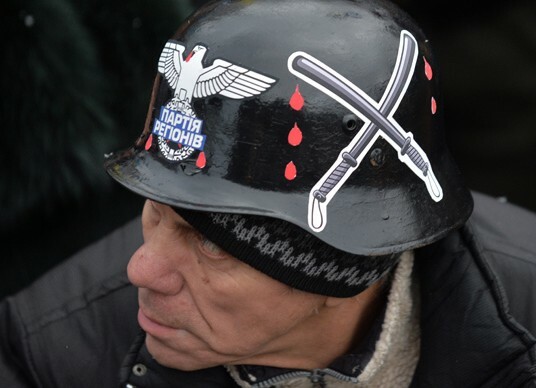 Putin’s administration has justifiably mobilized Russian/Ukrainian historical memory in revulsion against this scandalous recruitment, tapping into the memory of the horror of Nazism in the East, with its epic toll of 26 million dead to the cause of defeating the Nazis. Historians have noted, and former Soviet citizens certainly remember, that the systematic slaughter in the East, including by mass famine, has no parallel in world history. Understandably, Ukrainians in Dombass and in Russia, have endorsed Moscow’ “anti-fascist” campaign of denunciation against Kiev and indirectly, diplomatically, against the US. None of this intends to minimize the criminality of these US-backed murderous racists. It is precisely because of their willingness to commit atrocities that they were recruited and trained. There’s nothing new in this practice. The story goes back to the founding after 1945 of the US national security complex for propaganda and political warfare to roll back communism in Eastern Europe and the USSR. This story is told in Christopher Simpson’s Blowback: America’s Recruitment of Nazis and Its Effect on the Cold War (1988). Simpson’s book was e-published on 6 June by Open Road Media in the series “Forbidden Bookshelf,” curated by media scholar, Mark Crispin Miller, who chose five books to inaugurate the series. Among the five was Douglas Valentine’s The Phoenix Program about the CIA’s covert counter-insurgency operations in Vietnam (1968-72). Phoenix is listed by CounterPunch as one of the 100 Best Non-Fiction Books ever. Together, these two books say everything one needs to know about how the US government came to act in our time like a rogue state, riding roughshod over international law, arming and training reactionary terrorist groups, privatizing military operations, fomenting regime change through psychological warfare, spying on the whole planet, and acting generally as though the world would come to an end unless the US dominated it. Today’s ideologically absolutist/manichean foreign policy—“you’re either with the US or you’re with the terrorists”– is the continuation of the absolutism, which formed in the early post-war years: you’re either with us or you’re with the Reds. The recruitment of jihadists (as done originally in Afghanistan) in the 1970s and afterwards and now Neo-Nazis in Ukraine to undermine regimes reflects the practice by the intelligence services at the end of WW II of recruiting Nazis, most of them major war criminals. And the prize was the decisive opening salvo of the Cold War, based on Gehlen’s misleading information on the strength of the Red Army and its supposed readiness to invade Western Europe. Although, as Simpson notes, “in mid-1946, US military intelligence correctly reported that the Red Army . . . was underequipped, overextended, and war-weary,” Gehlen insisted that the Red Army (which, in fact, was engaged in tearing up one-third of the German railroad system for reassembling in the Soviet Union) was poised—500-division strong—for blietzkrieg on Western Europe. Adoptions of these concepts in Moscow [however] would be equivalent to saying that it was our objective to overthrow the Soviet power. Proceeding from that point, it could be argued that this is in turn an objective unrealizable by means short of war, and that we are therefore admitting that our objective with respect to the Soviet Union is eventual war and the violent overthrow of Soviet power. To avert such a (too clear) understanding of Washington’s intentions by Moscow, Kennan proposed something we know today as “regime change”—the secretly engineered internal destabilization of the Soviet Union by encouraging splits, divisions, and crisis, particularly in the satellite countries. The so-called Cold War, therefore, turned into four decades of covert warfare in pursuit of “regime change” in the Soviet Union. For this goal, it required the subversive arts of a specialized branch of intelligence, tasked with more than collecting and analyzing information, to be cloaked and protected by a necessary national security state. As late as 1940, as Britain brought to the notice of the Roosevelt administration, the US had not formed an intelligence organization (the FBI confined itself to domestic surveillance). Under British tutorials, the OSS was born, the progenitor of the CIA. At war’s end the national security state, as we know it today, began to take shape. Eisenhower’s call in1946 for a coordinated military economy and Kennan’s doctrine of containment in1947 combined to produce the National Security Act, which authorized the National Security Council and the CIA and led to the formation in 1952 of the National Security Agency (NSA), the umbrella organization responsible for oversight of all intelligence agencies—military and civilian. The activities of the NSA were shrouded in secrecy because, of course, they violated the Constitution. The extent of these violations—including targeted assassinations of world leaders– was not disclosed until thirty years later when the intelligence “community” came under scrutiny in a Congressional investigation in the 1970s, after the Watergate scandal. The Vlasov Army has frequently been portrayed in the West since the war as the most noble and idealistic of the Nazis’ émigré legions. . . . 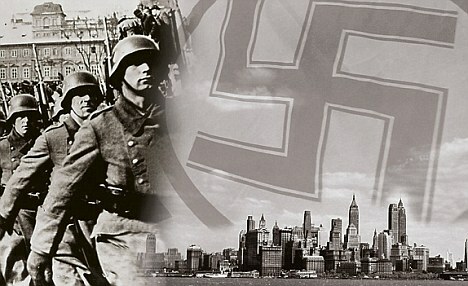 In reality, Vlasov’s organization [as recruited by US intelligence] consisted in large part of reassigned veterans from some of the most depraved SS and “security” units of the Nazis’ entire killing machine. . . . By 1945, about half of Vlasov’s troops had been drawn from the SS Kommando Kaminsky, which had earlier been led by the Belorussian collaborator Bronislav Kaminsky. . . . The Kaminsky militia [had] spearheaded the bloody suppression of the heroic 1944 Warsaw rebellion with such bestial violence that even German General Hans Guderian was appalled and called for their removal from the field. And yet, OUN war criminals such as Mykolas Lebed, were collectively and conveniently whitewashed as members of an army, which had acted, in the eyes of the foreign policy/intelligence establishment, as a “third force” within the Soviet Union, fighting for liberation and democracy from the Communist yoke, as Simpson remarks. At a certain point, a whole division of OUN/UPA troops, eleven hundred men and their families, were imported, no questions asked, into the United States. The influence of Ukrainian Anti-Communist émigré groups in American politics is longstanding, deep, and ongoing, as reading Simpson’s book makes perfectly clear. 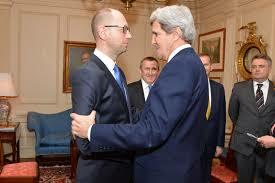 In general, it is not a progressive contribution, as the US-backed junta in Kiev could testify. But that’s another long story. As Christopher Simpson reminds us in the opening chapter, “The most prominent feature of the Nazi political philosophy [was] extreme anticommunism and particularly fanatic hatred of the USSR.” That hatred set the world ablaze, and, yet, after the war, the Nazi administrators, chief intelligence officers, generals, police chiefs, and intellectuals of that regime of hatred and war were recruited to continue their work in the bosom of our secret National Security State, advising, influencing, and promoting our foreign policy in the Cold War. Did that policy change with the fall of the Berlin Wall? No, it intensified—still absolutist, still aggressive, still dedicated to political warfare. Russia is still in our crosshairs. Peace remains an inaudible, distant sob. What need Washington fascism in Europe?